As promised, back for one more post today - this one also incorporates what was discussed in today's Holiday Card Workshop, with this week's CAS-UAL Fridays Challenge, which is to create a clean and simple masculine project. For this challenge, my card may not be the typical masculine card, but still, I thought as a holiday card, it could easily be given to a male coworker, or maybe our mail courier. As for how it fits with today's workshop topic...I mixed a traditional holiday stamp, with a non-holiday stamp (the airplane). Honestly, this is why I take these classes...to open my eyes, and learn how to use all my stuff more effectively, and creatively. I would never have thought to put these two stamp sets together, but as soon as I laid my eyes on the plane, I knew what to do. I love how the Christmas lights are being pulled by the plane. 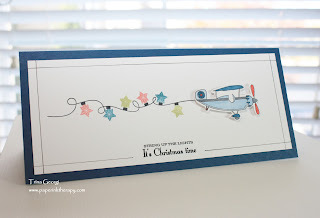 Really adorable card and fun way to use an airplane stamp on a great holiday card. I think is one of my favorite class cards I have seen! This is fun and very creative! I love the christmas lights and airplane. It's brilliant! Thanks for your sweet comment on my blog post today! Wow! This is an awesome card! I love how you combined the stamps to make a holiday card! Love your idea of giving it to a mail carrier also! Thanks so much for playing along with us this week at CAS-ual Fridays! Awesome card. I love your interpretation of the bonus day topic. NOw I will have to look at my collection in a new way-great card! Great card! I really like how you put the two different stamp sets together. What a fun card! Love your combination of stamps! Absolutely adorable! I love this idea... it's the perfect Christmas card! so cute! I love your card ,i love the colours , I love everything! Trina - this is ADORABLE! I love the plane pulling the lights! Thank you so much for playing along with us at CAS-ual Fridays!